We're back with another interview! Katie Hart owns Fitpup, a dog walking and training business in Halifax. Welcome, Katie! Q: How did you decide to open a dog walking business, and how long have you owned FitPup? 4 years ago my sweet puggle, Fendi, was hit by a car - a simple mistake that could have been prevented by teaching proper recall. I have always loved animals, I couldn't go anywhere without trying to smother random people's beloved pooches so after Fendi passed I decided to jump on my dream and start working with dogs. I started with basic obedience, because I didn't want to be responsible for other people pups without knowing exactly what I was doing. While mentoring with Unleashed Pawsabilities I realized how much dogs thrived by being outside together and romping around in nature, and I thought about when my dogs are their happiest, when they are outside in the woods chasing squirrels. All of our dogs have to have basic recall to join our groups, and if they don't we offer training so they can eventually be a part of the fun. Q: What types of services do you offer your clients? We have group walks for dogs that love running off leash in the woods with other dogs. We also offer private walks which are great for dogs that are not yet socialized or just prefer the company of a human friend. We work within a dogs limits, we understand that not all dogs have to like playing with dogs. We offer private sessions of basic obedience as well, which we highly recommend taking advantage of if you would like your dog to be a part of our groups but are worried about their recall. Q: Can you talk a little bit about what's involved in your daily life as a business owner and dog walker? Oh is that a learning curve. I am very lucky to have very patient clients/ now new friends! We have spent the past year working hard to pair up dogs with each other so they will have the most fun so that has been a daily event that is now coming together. I'm lucky to have an amazing team working with me, they help me endlessly build this business into one people can rely on and trust. So keeping us all organized, keeping contact with currant clients so they know about their pups either via text or through our Facebook page while in our care, answering emails and putting some wear and tear in my hiking boots daily. Q: Which areas does FitPup serve? We service Halifax, Sackville, Bedford, Fall River & now Tantallon. Mags is my dachshund/beagle mix. She is 12, I adopted her when she was just over 1 year from a lady who was bringing dogs that were about to be euthanized after Hurricane Katrina in Louisiana, over to Calgary where I lived at the time. She has always been an old soul and was the best hiking partner until an old injury/age slowed her down. Now she loves to have small walks and just relax at home until I get back and our Netflix marathons can continue. She's a cranky old lady but she's my soul mate, I will never have a dog like my sweet Mags. Coco is our family dog, we adopted her in Fendi's memory from Litters-n-Critters. She is a chihuahua mix, she is the opposite of Mags, she is social with everyone and everything. She'll wander into the woods with a groundhog if it means she could possibly have a new friend. She is currently in Agility learning how to do some cool things. She is very sporty, loves frisbee, running in the woods, swimming. Coco joins our group walks quite a bit, she's extremely easy going, and if you need a good face licking, just say hi to Miss Coco! I'm like a kid at Christmas when I go into any of the local pet stores. Pet Valu, Global Pets, B&R Pets Supplies & Best Friends. Q: Thank you so much for taking some time out of your day to talk about FitPup, Katie! Is there anything else you'd like to add or talk about? For our second interview of this series, I've reached out to Camellia Saunderson from Unleashed Potential K9 - The Valley. She runs this training company and has done some amazing things for many dogs in Nova Scotia! Q: How did you decide to go into dog training as a career, and what is the Unleashed Potential brand all about? I have always had a love for dogs, which is why I opened a dog rescue. in 2013, I brought in an extremely human aggressive 85lb dog who was extremely reactive aggressive toward strangers. I worked with a basic trainer in the city, socializing him to a variety of situations, people, and dogs and although he was progressing, he was still the same insecure reactive dog that came to me. 7 months in, he got into a fight with one of my dogs, resulting in my dog losing a limb, so I was left with a decision to make; adopting the dog out was not an option because he was far too aggressive still, keeping him was not an option, and despite what everyone was telling me, euthanizing was not an option, so I sent him to live with a UPK9 trainer. For two months I was terrified he would come home the same dog and I would have to euthanize him anyway, but he amazed me. When Tank came home, I could walk him on the Halifax boardwalk on a summer Sunday afternoon with adults, children, bicycles, dogs and more all around, without a single issue. That is what made me decide to get into aggression rehab, so I could help dogs like Tank who really need it, and that's when I packed my bags, and went and studied to become a results based trainer for UPK9. Q: What types of training programs do you offer your clients, or what behaviours do you address? I offer two training packages for potential clients; the board and train program and the ultimate obedience one on one program. With the board and train program, your dog would come and live with myself and my pack in my home for a results-based amount of time, average of 3-6 weeks, where he would learn obedience, focus and attention, impulse control, socialization, confidence building, and a proper leader/follower relationship between human and dog. Once your dog is fully prepared to go home and continue going everywhere you want to take him, we would do a full-day session where I train you on what your dog has learned, and then we do a follow up session to ensure everything is going well at home. With this package you will get all required training tools, group classes and pack walks for your dog’s entire life, and access to a trainer for advice should you ever need it. The best part about this package is that I do all of the hard work for you and you get to do all of the fun socializing after! With the ultimate obedience program, we train one on one, on average once per week, for a results-based amount of sessions. Whether it takes 3 sessions or 10, we will work together until we get to our desired results. From there we will do a few semi private sessions with other clients, and then you will be able to go to group classes and pack walks for your dog’s entire life to maintain the training. With this package you will also get all required training tools, and access to a trainer for advice should you ever need it. The best part about this package is that you get to do the training and grow along with your dog;. I also offer two training packages for potential puppy clients; puppy management and puppy lifetime. With puppy management, we train one on one, on average once per week, for a results-based amount of sessions. Whether it takes 3 sessions or 10, we will work together until we get to our desired results. From there you will get to attend group classes until puppy is 6 months old. With puppy training, we cover everything from crate and house training to socialization and obedience and more. Puppy lifetime is puppy management followed by my adult ultimate obedience program at 6 months of age. Commands that I teach include come, off, wait at the door, quiet, heel, place, sit, down, sit from the down, sit and down from distances. Behaviors that I address include a lack of impulse control, socialization, housebreaking, boundary training, focused attention and how to keep it, jumping up, digging, play biting, fence fighting, car manners, bolting,, dog, cat, and human aggression, and more! Q: What class or group options do you have available for clients and dogs? What about dogs who aren't comfortable around other dogs yet? All dogs who attend my group classes have undergone one on one training first. This allows the dog to go through the learning phase of the program with little distractions, before expecting them to be able to focus with large distractions such as people and dogs. During the one on one training, your dog learns obedience with lower level distractions, confidence building, how to focus on you, their handler, rather than other dogs or the environment, and to see you as a confident, assertive pack leader. This gives the dogs in my training program, as well as their owners, all the tools they need to be confident, humble, and under control in any public setting, such as group class. I know that there are some training tools that can cause some confusion or controversy among dog lovers. Q: Can you talk a bit about the tools that you use, and how they're used effectively/humanely? I specialize in a balanced training approach using electronic collars as a training tool. With over 100 levels of adjustability, our collars act as a muscle stimulator that grabs the dog’s attention, like a tens machine that a physiotherapist would use, giving us the ability to find the absolute lowest level that the dogs feels and teach him how to respond to it. This allows us to add pressure to our words, or give them meaning in a way that the dog understands, without going over the level that he truly needs. By doing this, you are using the collars as a motivational tool, rather than a punishment based tool. With a range of up to a mile long, today’s collars are so advanced that they can even be used under water, but the best thing about the electronic collars is that they are impersonal, so you can be as soft with your dog as you would like to be, and still get results. Coupled with electronic collars as a training aid, I use leash pressure and release techniques as motivation, teaching the dog how to turn off the pressure as reward, and immediately following up with a food reward, praise, or toy, depending on the individual dog’s preference. All dogs that go through training with me will undergo structured learning specific to their individual needs, where a number of systems and procedures are put into place to help create a well-balanced social creature. Some of these procedures include crate training for prevention of unwanted behaviors and absorption of learning, leadership exercises to accomplish respect, using the dog's regular kibble as an opportunity to use as positive motivation for increasing desired behaviors, multiple daily training sessions to increase drive, extensive socialization with humans and dogs, as well as exposure to many different environments and situations that they may encounter throughout the rest of their life, and much more. Implementing these things will help the dog to understand his position, know exactly what you are communicating to and expecting of him, and will help your dog be happy, humble and live a balanced life. I have four bully breed dogs, all with very individual personalities and stories. Diesel the valley bulldog came to me 5 years ago a complete mess; he had separation anxiety, generalized anxiety, food aggression, reactivity toward loud or moving things, as well as men who tried to touch him. Buddy came to me 4 years ago as a puppy and as he grew, it became very clear that he was dominant, pushy, and controlling toward other large breed male dogs with similar characteristics, being attacked on numerous occasions by other males just for walking by and then getting into a dog fight by the age of 10 months. Tank came to me in 2013 for extreme fear aggression toward any stranger who showed him the slightest amount of hesitation or nervousness. I got Blitz in 2014 with reported aggression toward humans and animals to he point where he was deemed too aggressive to live in society. Both Tank and Blitz were supposed to be euthanized by the same shelter for their issues, and I even had to fight to save Blitz because someone believed that killing a dog was a better option than training him. Today, all of my dogs are rehabilitated and help me train client dogs every single day. Diesel is my go-to for adding distractions because in his old age, he just does his thing and doesn't bother with the other dogs unless they engage him in a friendly manner. Buddy gets along well with all dogs now and comes to schools with me to help teach bite prevention seminars to children. Tank is at a stage in his rehabilitation where he can greet strangers without any proper structure or control needed and he helps to teach semi-private training classes and rehabilitate dogs with extreme dog aggression because he is so calm and laid back. Finally, Blitz comes absolutely everywhere I go, and this little dog who was once deemed too aggressive for society helps me teach one on one lessons and group classes and gets along great with small children, all dogs ,and adults. He is my biggest asset because he can read another dog or human's energy so extremely well, which has helped me out of a lot of sticky situations. As a whole, my dogs and myself form a balanced pack, used to rehabilitate aggressive, insecure, or simply out of control dogs every day. 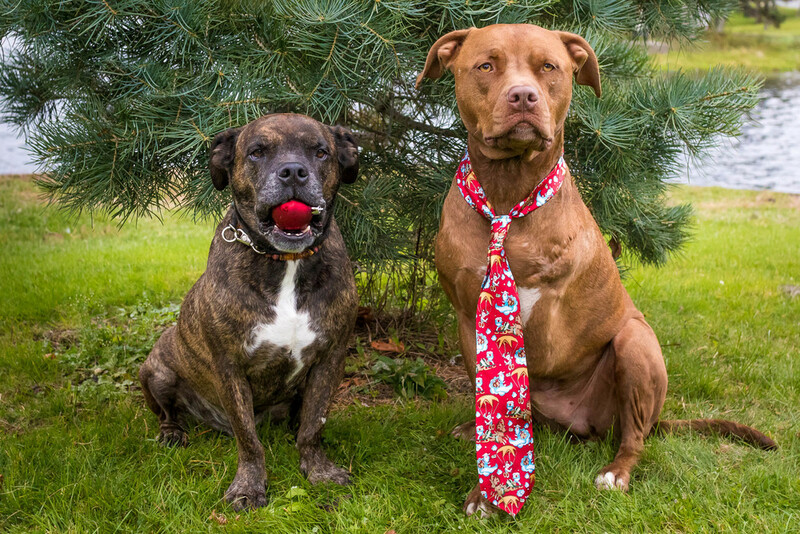 Diesel and Buddy, posing for Christmas photos. My favorite dog-related companies in the area are Wet Nose Images and Hound Tales Inn Dog Daycare. 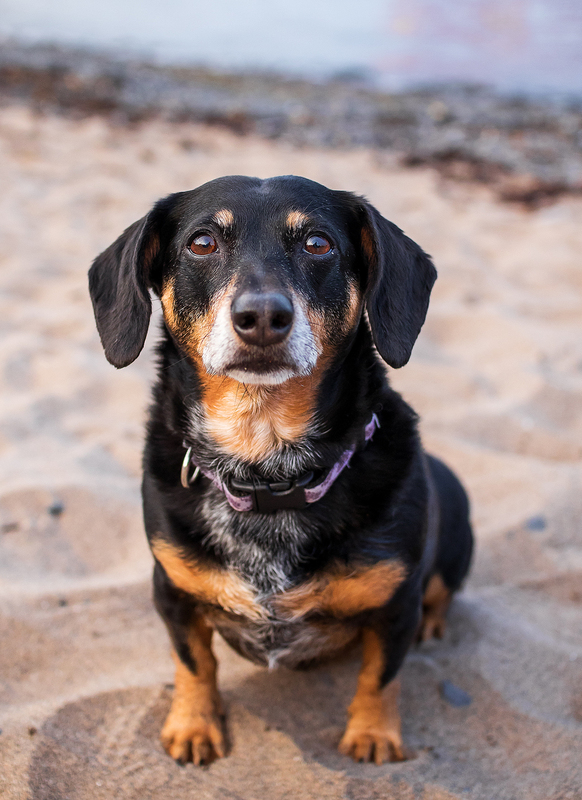 When I was running a rescue, Cassie from Wet Nose used to photograph all my adoptable dogs, free of charge, in an effort to help get them noticed and adopted quicker. I have done a number of photo-shoots with a number of dogs with her, and her sociability, calm energy, and understanding mind help greatly in getting the dogs settled and into the position where they are able to focus on the task. Leslie Murphy from Hound Tales Inn is always willing to lend a hand to a dog in need. Rescuing senior beagles herself, helping misunderstood dogs is her forte and taking in suitable fosters from any organization who needs help is what Leslie does. Apart from that, Leslie runs a great dog daycare on her property, allowing any breed without prejudice, basing her decisions to deny or send home a dog on temperament alone. Having pitbulls of my own and having run a pitbull rescue, Leslie has never refused one of my own dogs nor taking in a foster that was suited to her environment. Thank you so much for taking some time out of your day to talk about Unleashed Potential, Camellia! Is there anything else you'd like to add or talk about?